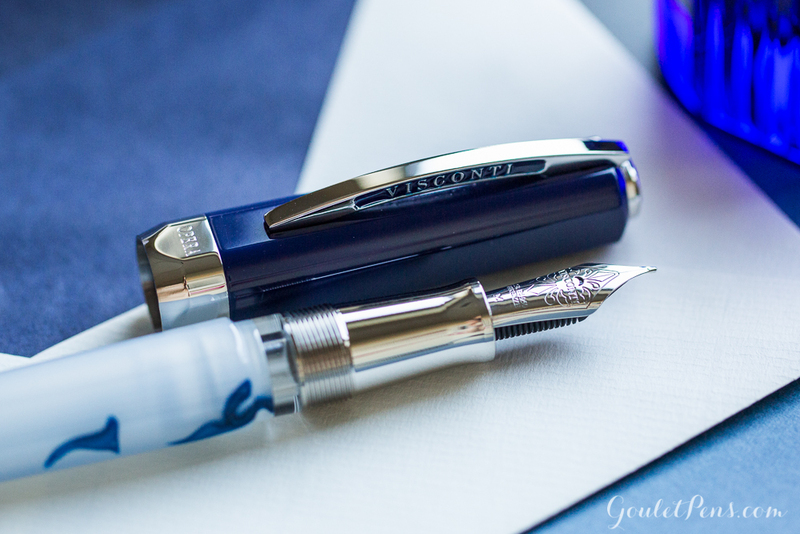 We’re incredibly excited to offer a new Visconti Opera Master called Blue Swirls! This beautiful pen joins the limited edition Crimson Tide that we released exclusively last month, as well as a number of other Opera Master pens from years past. filler system, which is a vacuum-filler that has an extra reservoir that allows you to write without needing to unscrew the filler knob. It has the delightfully smooth and wet 23kt Palladium Dreamtouch nib, the same as you will find on other Visconti flagship pens like the Homo Sapiens, Divina, and Opera Masters. Since it uses the same nib, it will write exactly the same as the nibs on other Opera Master pens. We’re offering the Blue Swirls in EF, F, M, and 1.3 stub nibs, though there is a broad nib that’s available by special order. 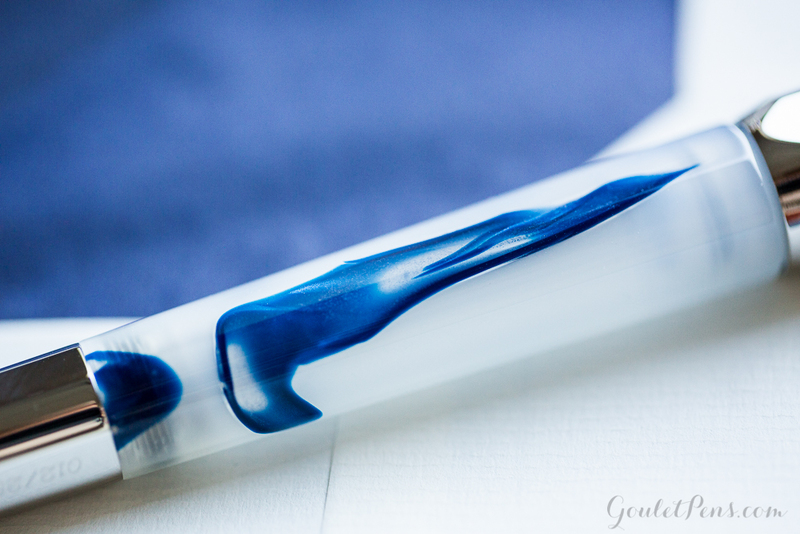 The Blue Swirls boasts beautiful waves of blue resin that envelop the semi-translucent acryloid in the barrel. The frosted look of the pen barrel will allow you to see the ink level in your pen, and the ink window will give you give you a clear idea of when it’s time to refill. The acryloid material is a blend of durable acrylic and natural celluloid to give a smooth, warm touch with the stain-resistance of acrylic. The navy cap pairs well with the blue waves in the body of the pen. Each individual pen is will have different patterns of blue swirls, making each one unique. blue crystal inkwell! The inkwell has a $295 retail and wonderfully complements the colors of the pen. This makes this a complete set, perfect to gift or add to your own collection. 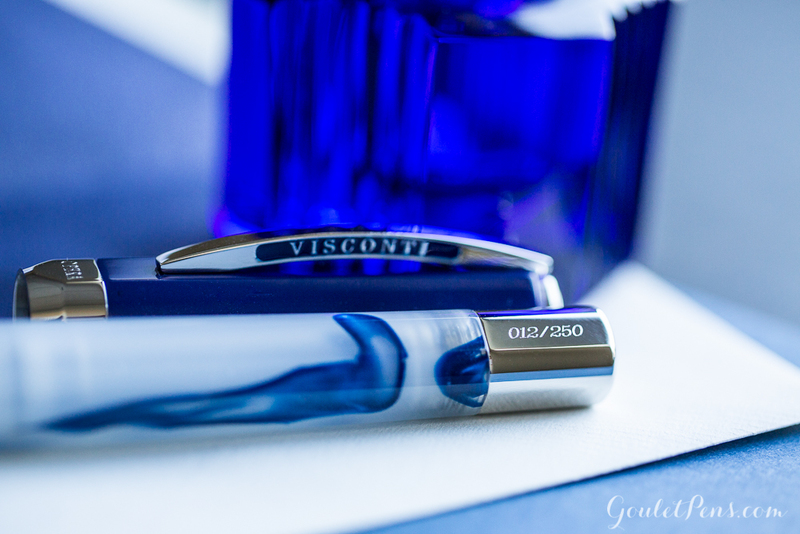 You can find the Visconti Opera Master Blue Swirls at Gouletpens.com listed at $1,095. However, once you add this pen to your cart, you’ll be able to see our best price available. You can also learn more about the Opera Master Crimson Tide and see videos on the double reservoir filling mechanism in this blog post. 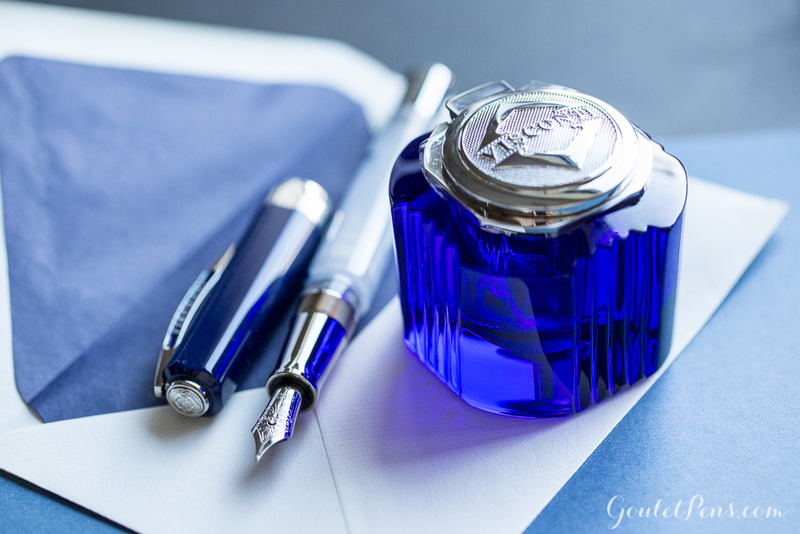 Here at Goulet Pens we’re big fans of anything blue, so we’re especially excited about this limited edition. What do you think of it?